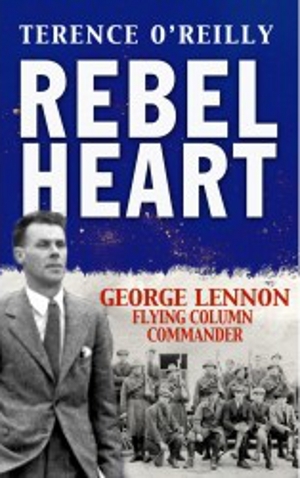 Terence O’Reilly, author of a number of books on Irish History including Hitler’s Irishmen and Rebel Heart, looks briefly at the life of George Lennon, an Irish war of Independence fighter with an interesting post war career. George Lennon was born in Dungarvan in 1900, to a comfortable middle class household, his father being the manager of the then thriving gasworks. The 1911 census indicates that by then George had two brothers and two sisters; at that time the family had a live-in servant and the children were privately educated. George’s father died in 1914 which resulted in the family having to cope with more straitened living conditions. George became involved with the Nationalist movement in Dungarvan at an early age, joining first the Fianna youth organisation and then the Irish Volunteers before his sixteenth birthday. On Easter Monday 1916, George and fellow Volunteer Pax Whelan took part in the holding up of a military train erroneously presumed to be carrying military material. Thereafter Lennon left school to devote himself fully to the Republican cause. In January 1918 Lennon and Whelan were briefly imprisoned in Waterford for their seizing of a Lee-Enfield rifle from an off-duty British officer. On his release Lennon received a hero’s welcome in Dungarvan, being carried shoulder-high to the town hall where he was prevailed upon to give a speech. In March 1918, Lennon participated in the fiercely contested local elections in Waterford City providing security for Sinn Fein election workers, during which he was obliged to take decisive action in firing warning shots when under attack by Redmondites. By 1919, Lennon had been active in the foundation of the Waterford No 1 Brigade of which he was appointed vice-commandant, overall command being held by Pax Whelan. In April of that year he was imprisoned in Cork for ‘illegal drilling.’ He was released in June due to health concerns and by September he had recovered enough to participate on the Fermoy ambush on the Shropshire Light Infantry, after which Lennon and comrade Mick Mansfield were obliged to escape on foot back to Dungarvan. In January 1920 Lennon took part in the first (unsuccessful ) attack on Ardmore RIC barracks and in May he travelled to County Limerick to take part in the epic all-night attack on the large RIC barracks in Kilmallock. Shortly afterwards, he was attached to the Old IRA’s first Flying Column in east Limerick, taking part in the ambushes at Bruree (30th July) and at Kildorrery (7th August). Returning to Waterford, Lennon organised the destruction of Bunmahon coastguard station to prevent its occupation by Royal Marines, and in September he was recalled to Cork by Liam Lynch to participate in a training camp for the North Cork flying column. In October 1920, Lennon returned to Waterford where he took command of the newly formed West Waterford flying column, then only a dozen lightly armed men based in the Tay valley in the Comeragh mountains. Their first action took place on 9th October, when a lorry carrying RIC men and Black and Tans was ambushed without loss at Brown’s Pike near Dungarvan. On 1st November the flying column with the assistance of local Volunteers carried out a successful ambush on a unit of the Hampshire Regiment at Piltown Cross, as a result of which twenty military rifles were captured. One British soldier was killed and several captured of which six were wounded; Lennon ordered that first aid be rendered to the prisoners and that transport be provided to allow the British to bring their casualties back to Youghal. Two weeks later another British Army unit was ambushed near Cappagh, and shortly afterwards, two RIC men were shot dead in two separate incidents in Cappoquin. On January 7th 1921, Lennon brought the column to participate in an ambush proposed by the East Waterford Brigade near Tramore, but the IRA force of nearly fifty was badly deployed with the result that when a British Army unit from Waterford was attacked, they were able to make a fierce counterattack causing IRA casualties. Lennon was able to extricate his unit and bring them safely back to base. Another unsuccessful ambush was attempted a month later near Ring, and on 3rd March 1921, a British Army unit was ambushed at Durrow railway station and kept pinned down there for several hours. A few days later, several British solders were captured at Kilmacthomas and were released unharmed. Shortly afterwards, Lennon’s column (now numbering thirty) was placed under the temporary command of George Plunkett, an IRA staff officer from Dublin. On the night of 18th March 1921, Plunkett led the column in an ambush of a British Army patrol at the Burgery near Dungarvan, as a result of which both British vehicles were destroyed, the British troops scattered, and prisoners were taken by the column, one of which was Captain DV Thomas, commander of the Dungarvan garrison. While the British soldiers were released, their scout (RIC Sergeant Michael Hickey) was ordered to be executed by firing squad. Lennon was obliged to command the execution of a man who had been a boyhood acquaintance, an incident that scarred him and greatly influenced his eventual conversion to pacifism. The following morning Plunkett led the column into a British ambush near the Burgery which resulted in the only two fatalities suffered by the column during the conflict. A chronic shortage of ammunition thereafter crippled column activities; an attack on a British outpost on 20th April was only made possible by the despatch of a small quantity of ammunition from East Waterford. On 29th April, Lennon led a small ambush on a British troop train at Ballylynch. By early July, the West Waterford flying column had attained a strength of 42 and on the 4th July Lennon led them in an ambush on a British troop train at Cappagh. As a result of this, the British Army garrison in Fermoy deployed over 300 troops into the Nire valley in an attempt to destroy the column. Lennon successfully led his column out of the attempted British encirclement and hostilities ceased on July 11th. During the Truce period, Lennon was appointed County Liaison Officer between the IRA and Crown forces in Waterford. He had prior knowledge of, although not actual participation in, two technical breaches of the Truce in the county namely the landing of a large quantity of arms at Cheekpoint in November and the bloodless ambush of a large convoy of Black and Tans at Dunkitt in March 1922. Lennon was present at the fateful debate in the Mansion House in January when the Anglo-Irish Treaty was ratified and De Valera led a walkout of his followers, marking the first step towards the Civil War. Lennon himself opposed the Treaty and became effective military governor of Waterford city, before taking part in the Civil War battle when the city came under attack by pro-Treaty forces in July. Lennon commanded the anti-treaty force in Ballybricken Jail, firing the first and last shots of the battle and coming under direct and sustained artillery bombardment. Disillusioned by the suffering caused to the local people, Lennon with over thirty of his men resigned from the anti-treaty forces.Thereafter, anti-treaty tactics (including destruction of vital railway services) cost them the vital support of the local population. Lennon attempted to return to civilian life, but the family business was in decline due to the advent of electrical services. In 1927 he emigrated to New York, working first for Prudential Insurance and thereafter as a night auditor for the Pennsylvania Hotel. Among other activities, Lennon briefly joined the Communist Party and helped to form a West Waterford Old IRA Man’s Association. Qualifying for a War of Independence Pension in 1935, he returned to Ireland the following year where he spoke out against the Catholic Church’s support for the fascist cause during the Spanish Civil War. In 1939 he married Kingstown Presbyterian, May Sibbald in the York Road Presbyterian Church, and the following year he was appointed an inspector for the newly formed Irish Tourist Board. During the war years Lennon took part in a major nationwide survey, the first of its type since independence and later to prove of inestimable historical value, and from 1943 became general secretary of the National Planning Conference which was prevented from official indifference from providing a think tank that might have prevented the economic catastrophe of the 1950s. Disillusioned by his efforts and by the stranglehold that the Catholic Church exercised over Irish society (in 1943 Lennon had his only son baptised a Presbyterian in defiance of the destructive Ne Temere decree which was subsequently upheld by Irish courts) Lennon emigrated permanently to the USA in 1946. Settling in Rochester in New York State, Lennon became attracted to the religious practices of the Society of Friends (Quakers), through which he later became a practitioner of Zen Buddhism and in 1967 he became a founder of the Rochester Zen Center. Lennon became a committed pacifist and participated in several protests against the Vietnam War. Lennon died in 1991 and was cremated without ceremony in Rochester. Incredibly, George Lennon has until recently been effectively airbrushed from Irish history, meriting only fleeting references in a few accounts of the time, although a 1947 Abbey Theatre play and an earlier novel were transparently based upon his life. Written by: Eoinpurcell on 7 September, 2011. Last revised by: John_Dorney9 September, 2011. 6 Responses to "George Lennon: A Different Kind Of Irish Hero"
Was he related to John Lennon (often called Lemon) from Waterford who fought in Spain? TV documentary available online here.